Is The Revenge Of High Beta About To Crash The Market? As stocks have become increasingly invulnerable over the last few weeks high beta assets have gone through the roof. The discrepancy between small caps and large caps has been particularly noticeable. Since the February 8th bottom, large caps have rallied 12.5% while small caps have rallied 18%. The divergence in performance has resulted in an unusual and potentially bearish scenario. The ratio of large cap to small cap performance has plummeted in recent weeks to levels that have been seen just twice in the last 5 years. 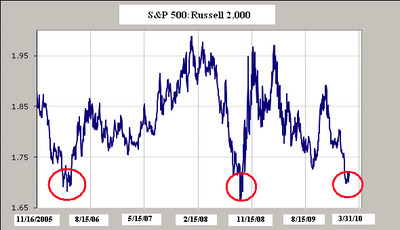 At roughly 1.7, the ratio is reflecting the extremely bullish posture of most investors (just who isn’t bullish about 2010 besides Credit Suisse?). This rare divergence between large and small stocks occurred in Summer of 2006 just before small caps declined 15% and then occurred again just weeks before the market crashed in October 2008. While this doesn’t necessarily mean the market is about to tank it does imply that high beta assets have become unhinged when compared to their safer low beta counterparts. Investors would be wise to take note.